John Sheridan has been unveiled as Fleetwood Town's new head coach until the end of the season. 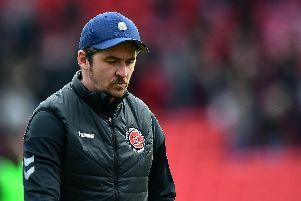 Sheridan steered Oldham to survival last term after joining in the second half of the season and now he has been tasked with guiding Fleetwood to safety. Ironically Sheridan's 13-game quest to keep Fleetwood up will see him go toe-to-toe with old club Oldham. The Latics are currently level on points with Town but an inferior goal difference means Oldham are in the drop zone. Sheridan left the Latics in September and arrives at Town with the aim of keeping Fleetwood in League One. It is understood caretaker boss Barry Nicholson his assistant David Lucas and Sheridan's former Oldham colleague Paul Murray will remain in the first team back room staff.